Unsightly blemishes are my nemesis. Seriously ... every time I see one pop up, I get angry and stressed, which of course just perpetuates the problem and makes them stay even longer. And I've tried everything -- redness-reducing creams, pimple vanishers, cleansers with salicylic acid and benzoyl peroxide ... nothing seems to work. But then I very luckily happened upon Neutrogena Rapid Clear Acne Eliminating Gel at the drugstore last week, and -- while I hate to sound dramatic -- immediately noticed results. The tiny tube intrigued me for a multitude of reasons, from the discreet clear gel held within to the fact that the gel in question contained a 2 percent salicylic acid content! I rubbed some on the offending mark in question the moment I walked in the door and waited to see if it would work any magic. And lo and behold ... after two applications I already noticed a significant change in the size and color of the beast! I've now been applying the gel twice a day for the last three days, and I can honestly say I'm amazed at the results thus far. I am most definitely hooked for life! 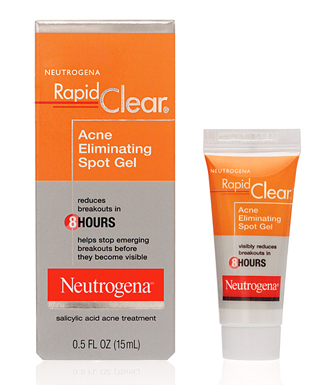 Neutrogena Rapid Clear Acne Eliminating Gel retails for $8 at drugstore.com. i'VE ONLY USED THIS FOR TWO DAYS AND MY SKIN IS ALREADY A LITTLE CLEARER. Which is absolutley fantastic. I recamended this to my kids and it actually works faster right before shes asleep. In the morning we both get up and our skin is clean. it may make the acne reder at first but it will eventually go away. your skin has to get used to the treatment. For clearer skin , finish it off with cold water, pat your face dry then finish with concealer or something like that.